“The Supreme Court and the Government should appoint more women in the High Courts because the proportion of lady Judges in High Courts is very low. It has to be raised”, she said. 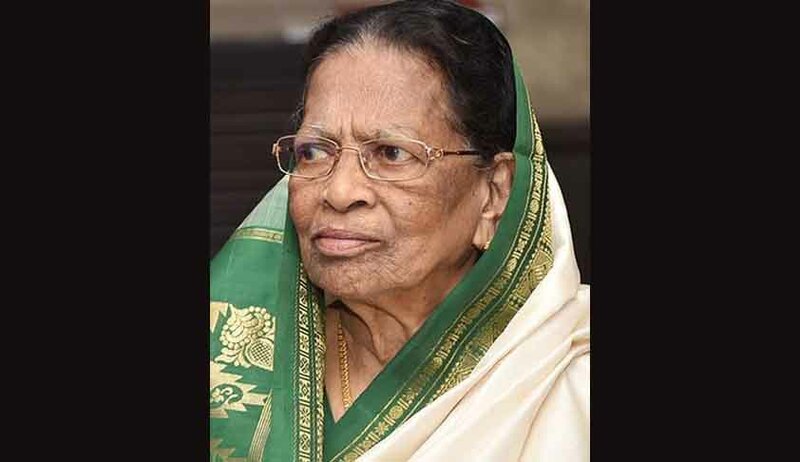 Justice M. Fathima Beevi, the first female Judge to be appointed to the Supreme Court of India, turned 90 on April 30. It is, however, not only her stint as an Apex Court Judge that has functioned as a legitimate motivator for several women across the country, but also her political escapades that have influenced the masses to mimic the political panache that she dared to don at a time when the hostility of gender bias was just beginning to be realised. Hailing from Pandalam in God’s Own Country, Kerala, Ms. Beevi completed her schooling at the Catholicate High School in Pathanamthitta, before going further afield to acquire her Degree in Bachelor of Science from the prestigious University College in the picturesque city of Trivandrum. She then went on to obtain her Bachelor of Law Degree, from the Government Law College, and thereby, enrolled as an Advocate on 14thNovember, 1950. She began her career in the lower Judiciary of Kerala in 1950, the same year that the Supreme Court was set up. She soon rose through the ranks -- serving as the Munsiff in the Kerala Subordinate Judicial Services, as a Subordinate Judge, as a Chief Judicial Magistrate, as a District & Sessions Judge, as a Judicial Member of the Income Tax Appellate Tribunal -- to become a High Court Judge in 1983, and a Supreme Court Judge in 1989. She was also the first Muslim woman Judge to be appointed to any Higher Judiciary. Besides, she holds the distinction of being the first woman Judge of a Supreme Court of a nation in Asia. As a Governor, her rejection of mercy petitions filed by the four condemned prisoners in the Rajiv Gandhi assassination case had made headlines. Her stint as a Governor was further marred with controversies, having prompted the ire of the Central Government for giving a clean chit to the law and order situation in Tamil Nadu. The then Minister of Law, Mr. Arun Jaitley had then asked for her resignation. Her assessment of the sequence of events after the arrest of the former Chief Minister, M. Karunanidhi, and the two Union Ministers, Murasoli Maran and T. R. Baalu had also come under criticism by the Centre. She had, however, remained unfazed, and had occupied the office from 1997-2001, a period of four years. She also served as the Chancellor of Tamil Nadu University during her tenure as Governor, and was the recipient of the Hon. D. Litt and Mahila Shiromani Award in 1990. She was also awarded with the Bharat Jyoti Award and the U.S.-India Business Council (USIBC) Lifetime Achievement Award. Having emerged as a shining star in her own right on the firmament of Indian culture and politics, Ms. Beevi could be said to have fulfilled her destiny and upheld the ancient legacy of poets, painters, sculptors and musicians in the Pandalam royal lineage. Not much has, however, changed since Ms. Beevi’s appointment, with the Apex Court having never had more than two women Judges at any one given instance. While her appointment was hailed throughout, the judicial system is still trite for an All Boys’ Club, with restricted entry and limited gender passes.
. Ms. Beevi, however, in her own pursuits, achieved what had been considered unachievable in our primarily patriarchal society, with the torch of reform being passed on to several women who have since looked up to her.